As I am about to head out to a concert at the Edinburgh Jazz Festival I thought I should point out that Alex Welsh came from Edinburgh. Not many musicians do. Its a small city and with all our festivals we tend to be awash with players from outside. Alex Welsh learned to play the cornet with Leith Silver Band along with a friend of mine (now in hos 80's and still playing). He was one of the select group of jazz trumpet players who chose to play mainly cornet rather than trumpet - others include Warren Vache, Digby Fairweather, Wild Bill Davidson and Ruby Braff. Alex Welsh died in 1982. 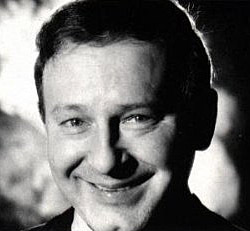 Accroding to Digby Fairweather, in his book Notes from a Jazz Life, Welsh was told by his doctor that if he drank another bottle of Vodka he would die. So he took a bottle of vodka and died after drinking it. Don't let this story put you off though. Alex's music is joyful, warm and full of life. Its a pity that his recordings tended to be across smaller lables as it means there are not too many available to buy these days, but if you keep an eye out you will find them, although perversely you will rarely see or hear of him in Edinburgh.